Reviewed by Dr. Surat P, Ph.D.
Melanin is a major pigment present in vertebrates. The type and rate of melanin synthesised determines both skin and hair colour. Melanin is a light absorbing polymer derived from the essential amino acid tyrosine, which scatters UV light and converts it into heat. Melanin’s ability to absorb light has many protective functions in vertebrates, including camouflage, protection from damaging solar UVA and UVB irradiation, and thermoregulation. Populations producing higher levels of epidermal melanin have lower rates of skin cancer, due to its photoprotective qualities. Melanin also acts as an antibiotic and free radical sink. Due to its wide range of functions, melanin is expressed in several areas of the human body, including the skin, hair, eyes and the brain. However, melanin’s specific roles within these tissues are poorly elucidated. Pheomelanin – an orange to red pigment, expressed in the hair and skin. Low protective properties against DNA damage induced by UV radiation. Eumelanin – a brown to black pigment, expressed in the hair and skin. Higher protective properties against DNA damage induced by UV radiation. Neuromelanin – expressed in several regions in the brain. Its loss is associated with several neurological disorders. Melanin is synthesised in cytoplasmic organelles called melanosomes, which reside in skin cells and hair follicles called melanocytes. This process is known as melanogenesis. Melanocytes express a highly polymorphic gene which encodes a G-protein Coupled Receptor (GPCR) called melanocortin-receptor 1 (MC1R). In humans, there are over 100 MC1R variants, each with different activity levels. As well as melanin production, the activity level of MC1R within melanocytes is a major determinant of the human skin colour. 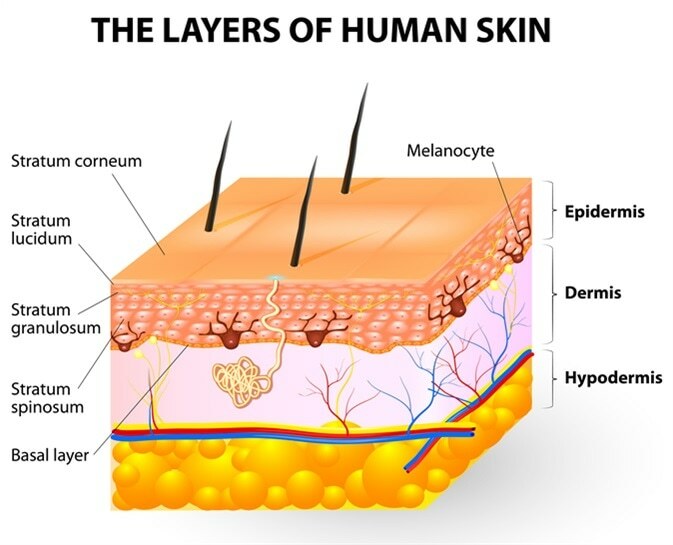 Melanocytes are mainly restricted to the basal layer of the epidermis where they form an ‘epidermal melanin unit’, consisting of one melanocyte, around 36 keratinocytes, and one Langerhans cell. A major extrinsic regulator of melanogenesis is ultraviolet radiation (UVR), including UVA and UVB light. This is the main stimulus for melanin production, leading to induced pigmentation of the skin, or ‘tanning’. Other stimuli of melanogenesis include androgens, which is a natural steroid hormone, and inflammatory mediators. UVR increases proliferation and recruitment of melanocytes to the epidermis, as well as the production of melanosomes. This occurs due to an increased level of reactive oxygen species, which causes DNA damage and activation of enzymes involved in melanogenesis, such as tyrosinase. Extended periods of high exposure levels to UVB light can trigger extensive DNA damage. This may cause programmed cell death (or apoptosis) of affected cells in the skin, which is also the cause of ‘sunburn’. In other cells, the DNA damage repair pathway is triggered. In this pathway, the transcription factor and tumour suppressor protein p53 becomes stabilised and activated in keratinocytes with DNA damage. This leads to an increased production of melanocyte stimulating hormone (MSH). MSH then binds to MC1R receptors expressed on melanocytes generating a cyclic AMP specific response. cAMP activates protein kinase A, which phosphorylates cAMP response element (CREB) transcription factor. CREB upregulates the expression of microphalmia-associated transcription factor (MITF), resulting in the upregulation of enzymes involved in melanogenesis and proteins which transport melanosomes. MITF can also be activated by mitogen-activated protein kinases (MAPKs). cAMP and MAP kinase pathways triggered downstream of UVR induced DNA damage synthesise amino acid tyrosine. Tyrosine is converted by the enzyme tyrosinase, activated by UVR, into dopaquinone. Dopaquinone itself can be converted into eumelanin or can be converted into dopachrome which is then converted into eumelanin. Dopaquinone can also be converted into cysteinyl-dopa, which is converted into pheomelanin. A lack of tyrosine is associated with albinism, which is characterised by loss of skin and hair pigmentation. Melanosomes are then transported from melanocytes into keratinocytes, which reside in the upper layers of the epidermis. Within keratinocytes, the membrane of melanosomes is degraded by lysosomal enzymes. This releases melanin into the cytoplasm, where it forms a melanin ‘cap’ around the genetic material of the cells. This protects DNA from further UV damage.